As the temperatures heat up, I become less inclined to turn on my oven and more excited about grilling! 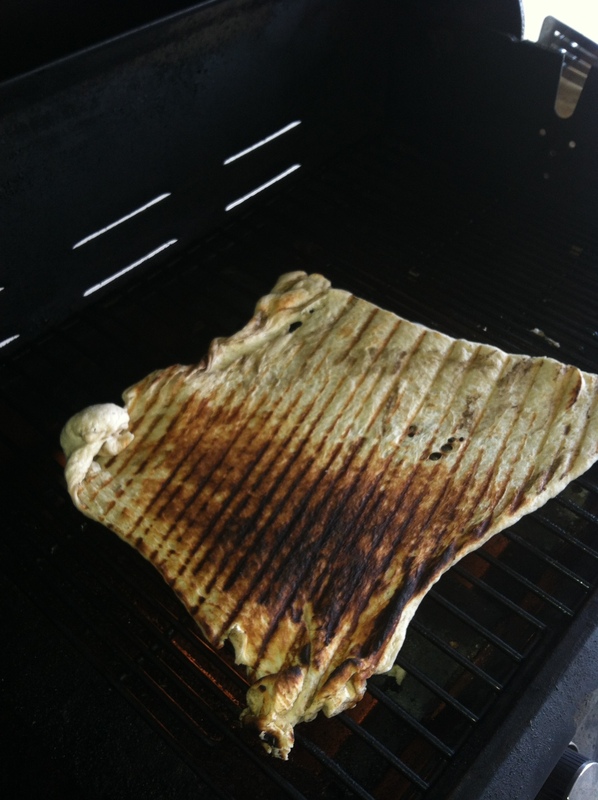 So this week I decided to take a little risk and make a pizza on the grill. It seems a bit intimidating at first, but the results are well worth it. 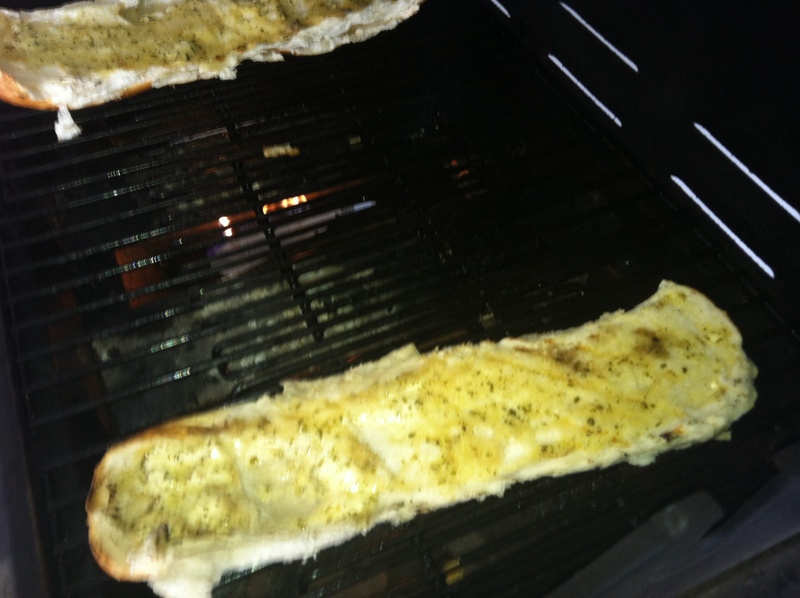 1 Turn the grill on with the burners on high and let heat for 15 minutes, to about 400°F (if your thermometer works). 2 Turn the burners down to medium. Combine olive oil with a pinch of garlic salt. Brush this directly on the grates of your grill. 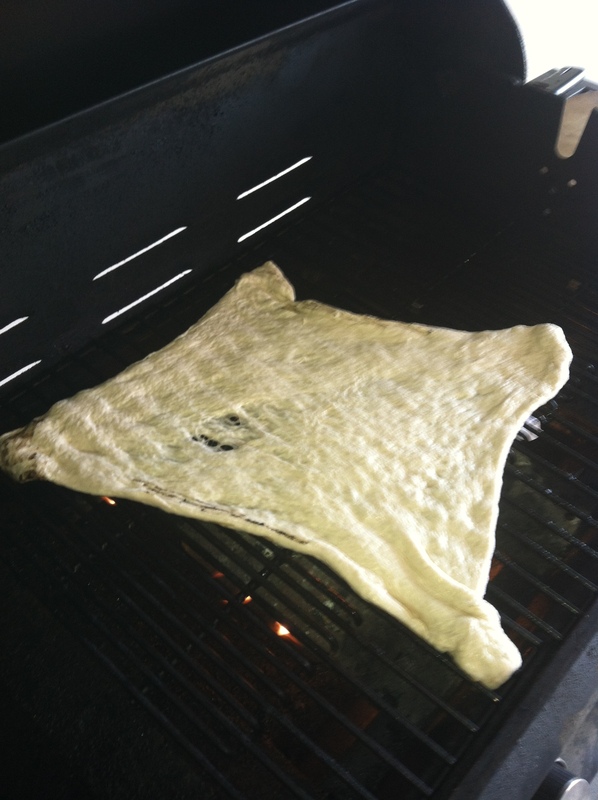 3 Throw (maybe gently place) your pizza crust on the grill. It bubbles up pretty quickly and won’t fall through the grates. Let it cook about 3-5 minutes. Next use 2 spatulas to flip the pizza crust and cook the other side. 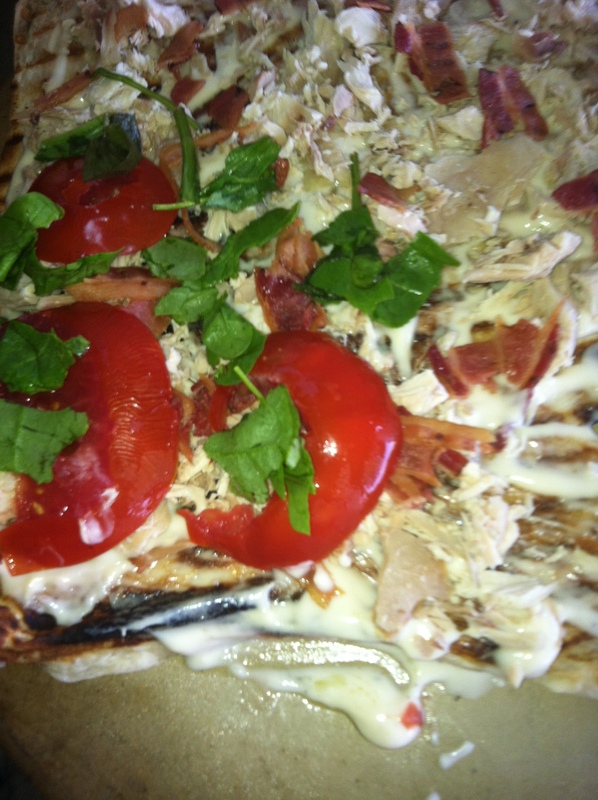 For this pizza, I started with a store bought crust in a can – c’mon, there is no way we have enough time to made a homemade crust in the middle of the week! 4 Add your toppings while the other side is cooking. I added about 4 tbs of alfredo sauce, followed by the shredded chicken, bacon, tomatoes and spinach. 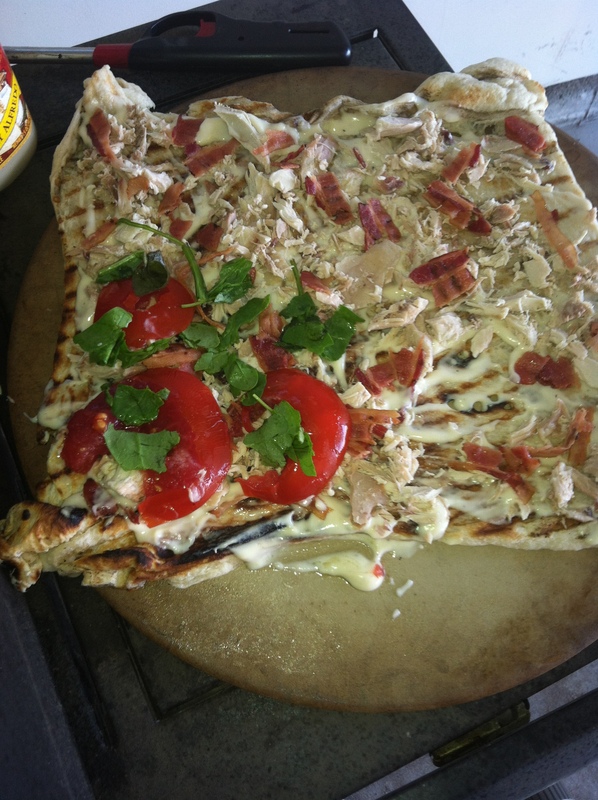 Top with mozzarella cheese if desired. 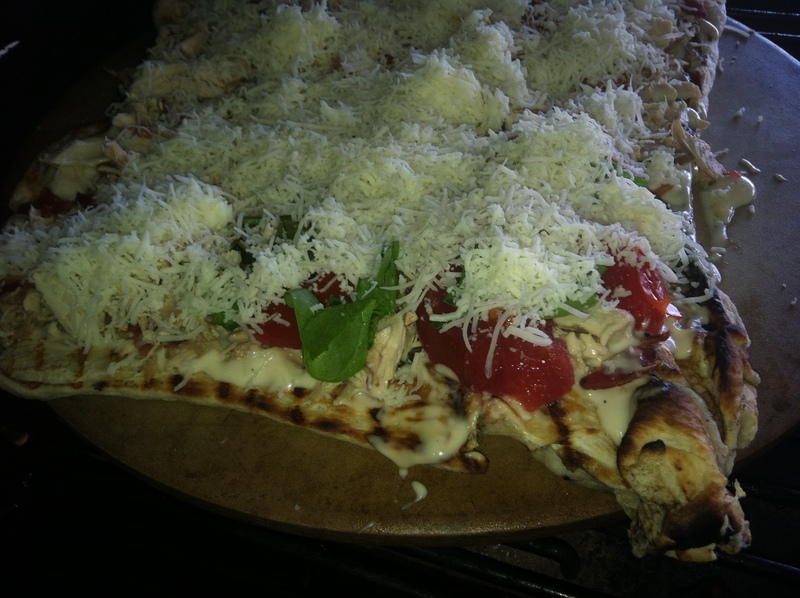 The great thing about pizza is you can put anything on it and make each part of it a little bit different. Also try throwing your garlic bread on the grill. It works great! 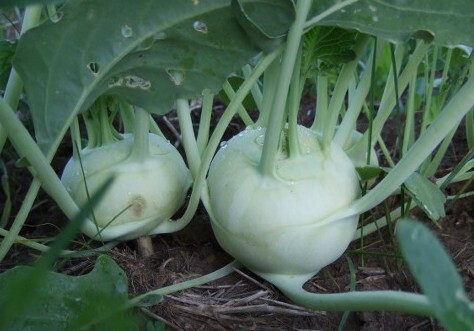 So many people have no idea what kohlrabi is or how to eat it. We always say the best way is raw! 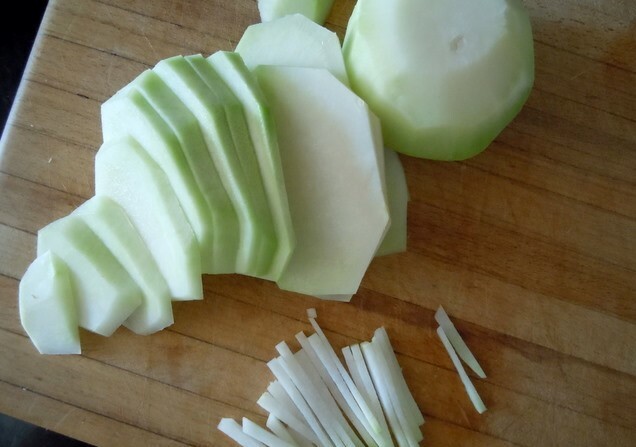 Cut the green skin of and slice into wedges. You can store them in a bowl of water in the fridge to keep them crisp! 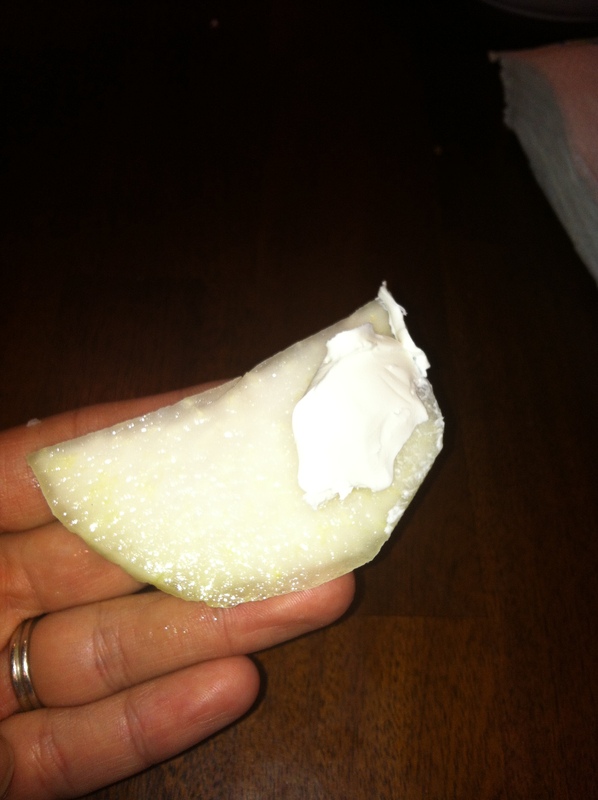 But my kids like it a different way – eat it raw WITH cream cheese! I know it sounds crazy, but my kids (2, 3, and 5) love it that way. Let us know what you think? 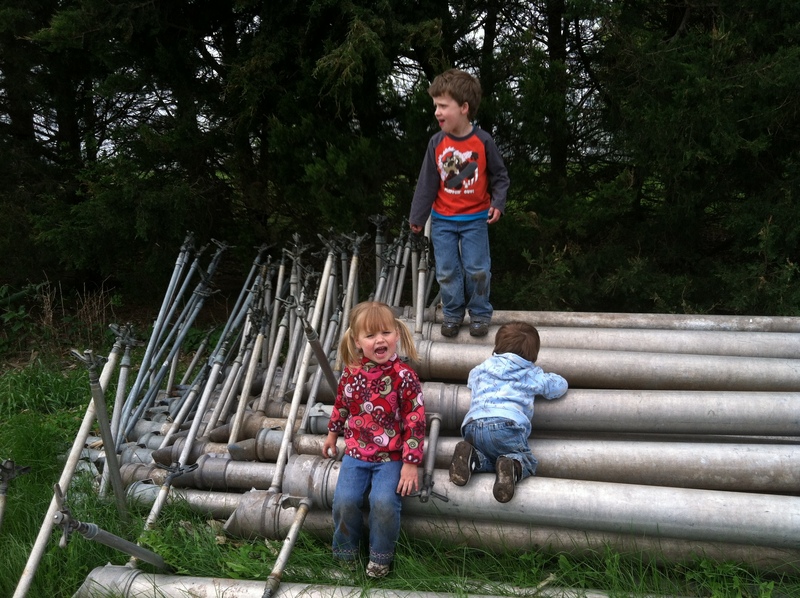 Like always, there are lots of activities that have been taking place on the farm. We had a bit of a watermelon debacle earlier this season. 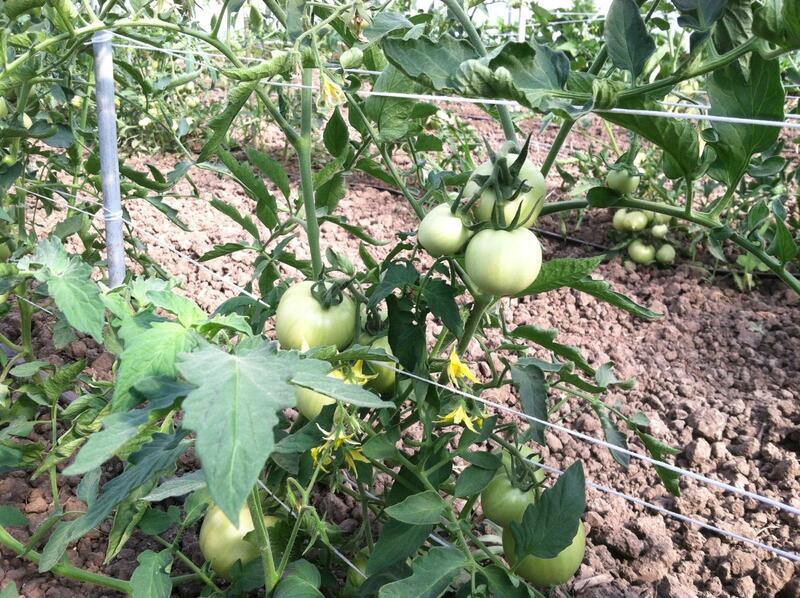 Our watermelons are started in trays in a greenhouse or cold frames. Unfortunately we had horrible germination – meaning we had some varieties where only 1 seed out of 70 came up! 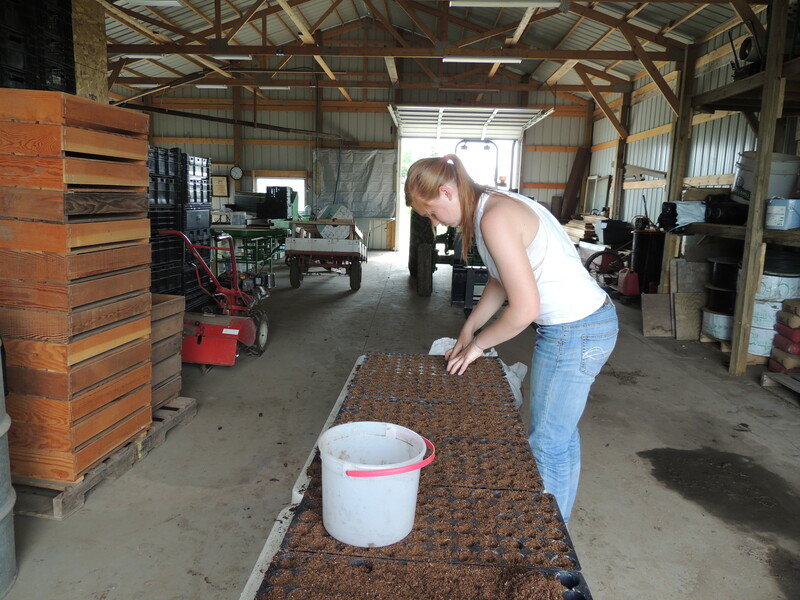 Brittany is in the picture below working on re-seeding watermelons. 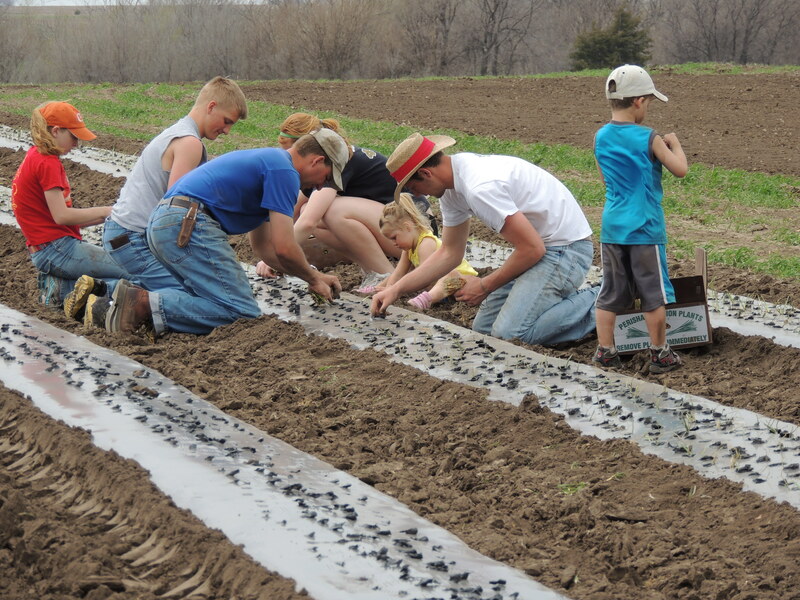 Luckily re-seeding is not a common activity on the farm – but stringing tomatoes (and peppers) is! Now that the sun has decided to join us for the summer, the tomatoes grow much faster. If you’ve ever grown tomatoes you might be used to putting them in a cage. On the farm, we use stakes and string woven in-between and around the plants to keep them standing. Week 2 of Pekarek’s Produce CSA was on June 12. All of our members should have received a printed newsletter, but now its up on the blog as well! 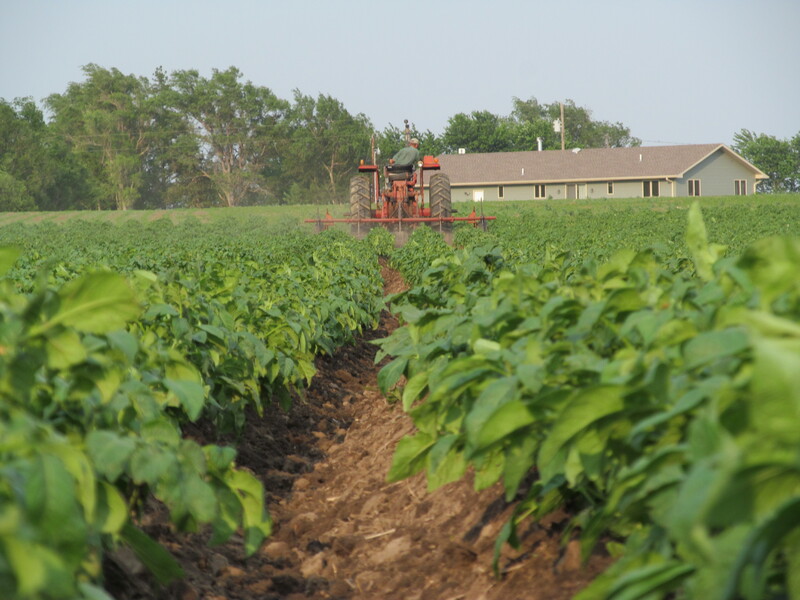 We are excited to say that the last week has been very busy at Pekarek’s Produce. It may be hot, but we are very happy to see the sun come out! We are also happy to say that your produce bags will be nice and full. 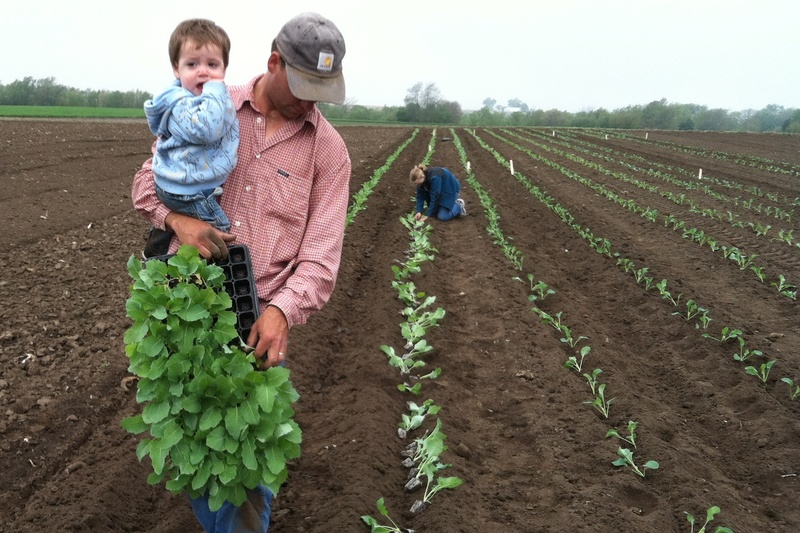 The farm has been very busy with planting, weeding, and picking – not to mention a few maintenance activities. Its hard to believe that with the season just into full swing, we have planted our pumpkins and edible squash for the fall already. Lettuce and Spinach is growing beautifully. 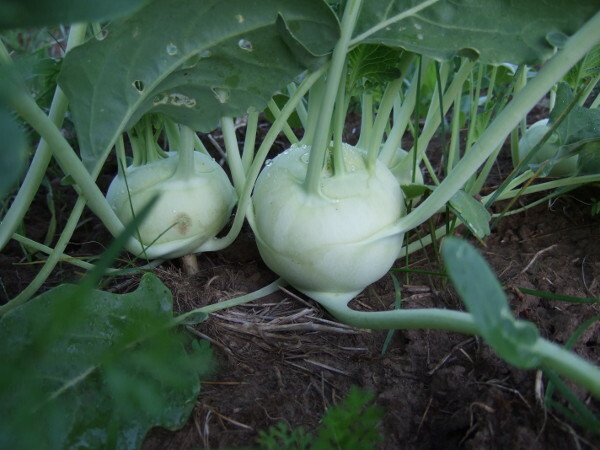 We are also happy to tell you that you are receiving the first of our Kohlrabi crop this year. For those of you getting green onions this week, if you wonder how they grow, look at the picture below. This is our first year with a plastic mulch layer. After laying the plastic, we poke holes in it with a glorified pitch fork. Then we crawl on hands and knees to plant each green onion individually. These are really a favorite on the farm, because they are one of our first crops to be harvested and a good reason to get a crew together. Finally, new this year, we will be inviting all of our CSA members out to the farm for a tour, so watch for more information next week. Today is the first day of the CSA! We hope everyone is excited to get there fresh vegetables each week. There are a couple of details to take care of as we begin the year. Each week your vegetables will be delivered by Ryan. Your vegetables will come back to you in a tote bag. Please be sure to return your bag each week so that you can receive you new bag of produce. So where can you pick up your vegetables? From 4:15 – 6, we will be at the Farmer’s Market, located on the north side of the courthouse. Each week we will have a short newsletter describing some aspect of the farm, from hilling potatoes to cold frames and more. As Ryan is always covered in dirt or mud, your newsletters will come from me, but if you’ve ever met Ryan, you can be sure he will be telling the good stories. We look forward to a great season!